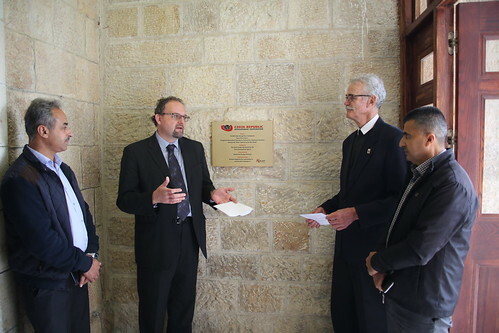 Bethlehem University held a handover ceremony of the new 30KW solar photovoltaic panels that were installed on the rooftop of its 125 year-old De La Salle Building. The project, supported by the Czech Republic through the Czech Republic Development Cooperation, was implemented by Brothers Engineers for Contracting, Excellent Systems Co., at the instigation of the Palestinian Energy Authority. He also noted that in the last 50 days the electricity input from this plant alone has been 6,862 KW a little over 5400 shekels ($1,445). So a reasonable estimate for the year is that this will save the University in excess of $10,000 per year. The Honorary Consul of the Czech Republic Mr. Samir Hazboun, Mrs. Candida Kornakova and Mr. Martin Naprstek from the Czech Development Cooperation attended the ceremony in addition to Mr. Walid Othman, from the Palestine Energy Authority, Eng. Khaled Salahat of Brothers Engineers for Contracting, Excellent Systems Co., and Faculty and Staff of Bethlehem University.